Mary J.’s back with more to say AFTER that infamous bitter Easter Sunday tweet. 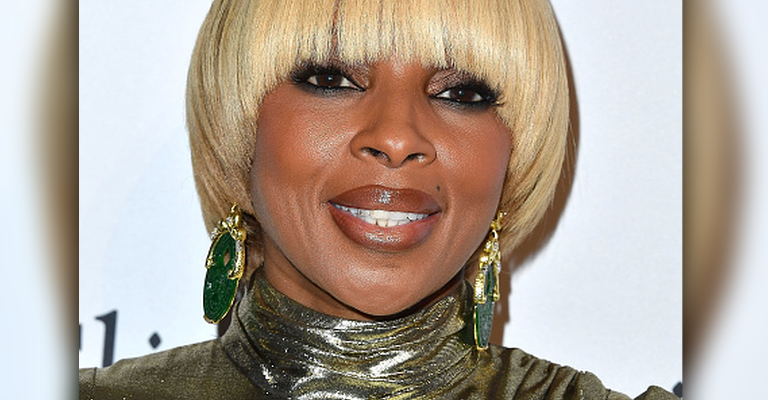 On Sunday, Mary J. Blige turned quite a few heads when she posted a colorful tweet about her estranged ex-husband Kendu Isaacs. By now, everyone knows Kendu has made Mary’s life quite difficult over the past few months. Their divorce proceedings haven’t been resolved due to Kendu’s staggering list of costly demands. 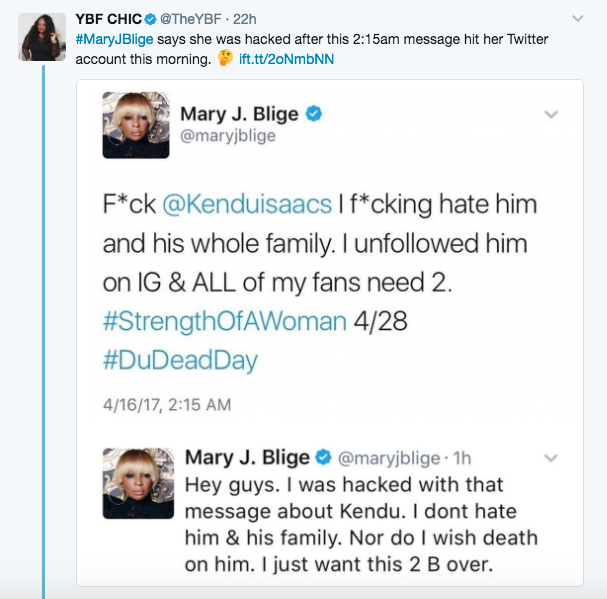 Since Mary “Not Gon’ Cry” Blige singer refuses to simply throw her money away to get Kendu to leave peacefully, she’s fighting back. So, it may take some time for them to come to an agreement. But, this morning, a colorful statement was posted on Mary’s Twitter account and most fans sympathize with the singer’s statement. As we previously reported, Mary welcomed Easter Sunday with a bang when she took to Twitter with a jaw-dropping rant about Kendu. The singer basically said what most fans would expect from an estranged wife. Of course, the shocking tweet has since been deleted, but not before fans had the change to snap screenshots. Hmmm… Hacked? This Isn’t The First Time For Mary J.
I love me some Mary J., Lawd knows I do, BUT here’s what I’ve concluded from all of this hack talk: (1) Either Mary has some trigger-happy-Twitter-fingers that blast off before she can rationally think things through regarding her impulse tweets; or (2) Kendu or one of Mary’s other enemies have ALL the passwords to her social media accounts and are using them to their advantage; and we can’t forget about (3) this is excellent publicity for her upcoming album, Strength of A Woman (which I can’t wait to actually cop on 4/28/17). Honestly, my opinion lies closer to the side of somebody in Mary’s camp is lying and she’s got trigger-happy-Twitter-fingers. But hey…what do I know? I’m not sitting next to Mary at the time that those tweets are going up, so I could be a 100% wrong. Just saying though…after that January 2017 suspect tweet about her announcement that she was dating her Mudbound co-star/Straight Outta Compton actor, Jason Mitchell, quickly posted and then deleted on her Twitter page…and now this…it’s looking kinda suspect. I still love you though Mary. Again, despite what fans think, Mary insists it was all a big misunderstanding. Hopefully she and Kendu resolve their differences soon and come up with a reasonable dollar amount…keyword being reasonable *coughs Kendu*…that will leave both parties happy and peacefully divorced with ‘No More Drama’ in their lives.